I am finally joining in on all of the fiberglass fun. With my recent win of an Abel Reel in an F3T photo contest, I needed a rod to go with the satin blue colored reel. I am one for things to look good, and a blue reel wasn't the easiest reel to pair with. At first, I thought about all the beautifully colored fiberglass rods from Swift Fly Fishing, and Blue Halo...and then I started looking at the price. I just couldn't do it. Then it hit me, duh, how about those yellow Eagle Claw Featherweight fiberglass rods. It's a match! Now I'm just waiting for the blue line I ordered from Shadow Fly Fishing, and then I can take it out on an outing. Looking forward to it! My GF passed on whatever sickness she had last weekend to me, so, I can be miserable this past weekend. With temps in the 40-50s and the sun shining, I watched from our 2nd floor bedroom window as all of the snow melted away, and ice start to retreat to corners of the backyard lake. Saturday afternoon I had it. I just had to go outside and make a cast, and to get some fresh air for me and Bo (One of our dogs. The other is visiting my mom.). My GF eventually came outside and enjoyed the sunshine, as well. I casted a square bill lure in a natural colored pattern with my baitcaster. I hooked something 10 minutes in, and to my surprise it was a carp!! It was hooked on the outside of the mouth with the front treble hook, and on the side of the head with the back treble. Is it a catch? - I'll allow it. Right behind me is my GF's townhouse. Pretty sweet! ...and here's the face I'm sure everyone makes when a fish is set to flop right out of your hands. Luckily, this one didn't escape my grasp, but you can definitely see the concern on my face. HAHA! This picture is definitely a wall hanger! Off it goes. Hopefully, the next time I hook up with that carp, it'll be with my fly rod, and I won't be sick. Don't you just love a good release shot! I know I do. Not bad for a 15 minute outing. Oh, Happy Days!! **It started to snow again on Sunday afternoon, and as of this Monday morning, I can see that we accumulated about 3 inches of heavy wet snow. When will it end!!! 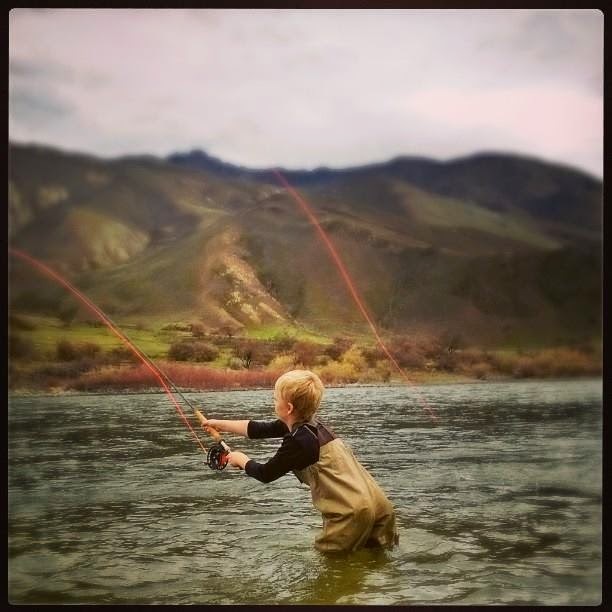 I love seeing photos of people catching fish with the flies that I tied. Evan (you can find him on Instagram @coloradooutdoorsman) hooked up with his first norther pike out in Colorado with a big bass fly I had sent him. How awesome is that!!! 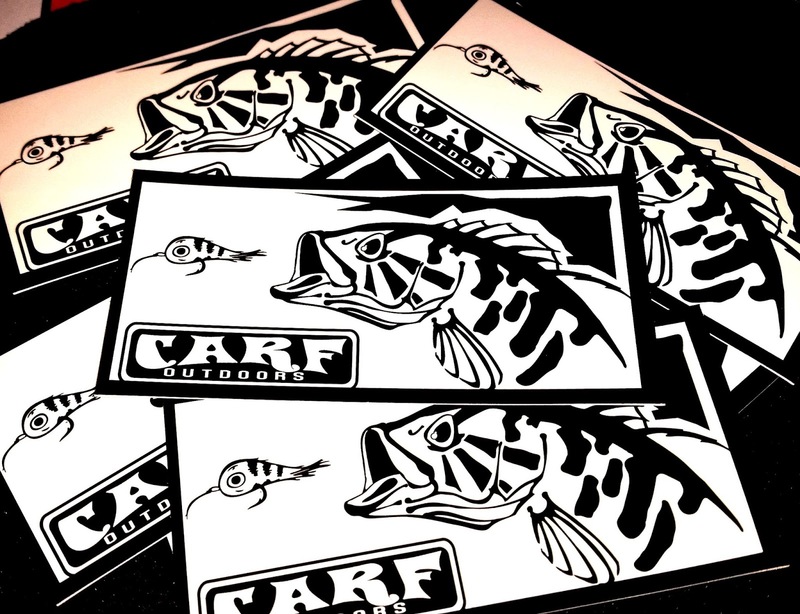 Lately, I've been in the giving spirit, so, I would like to offer all of you one of my Carf Outdoors stickers! Just shoot me an email at carfoudoors@gmail.com...or if we're friends on FB you can just shoot me a message on there. With extremely beautiful weather of 60 degrees that we've been experiencing, I've found a resurgence in my motivation (I think it's because I can now wear shorts!). I've been getting a ton accomplished around the house, and at the vise. The lake in the backyard is showing open water along the shorelines, and it has me fired up. I've been a tying machine! Filling up empty slots in my personal arsenal. On my musky and pike flies, I normally use eyes with a clear cure goo head, but I've been wanting to try something different. I've seen quite a few people using spun deer hair on the heads of their flies, so, they're able to push more water around. So, I gave it a whirl, and I am extremely happy with the results. What do you think it best resembles? I think it resembles all of those in some way, but I smell a rat. Here's to hoping those DPR pike, and musky up North love these! Usually with stuffed peppers I either use Italian sausage or ground sirloin. I'm becoming a big fan of ground turkey, and thought, how would this taste as the meat substitute in my stuffed peppers. So, I gave it a try, and I must say, it was very tasty! While I'm still a huge fan of spicy Italian sausage, I think the turkey will be a nice change up once in awhile for future meals. Cook the ground turkey in a frying pan, with diced/sliced mushrooms, white onions, and a lot of minced garlic. Other ingredients used during this process - Extra virgin olive oil, oregano, and pepper. Once you're able to break up the turkey, add a can of diced/sliced tomatoes. For this one I used a can that had some seasoning already added to it. I think it was garlic basil, and then let it simmer on low heat. While the turkey is simmering, you can prepare the peppers. You can use any color your heart desires. I went with red this time. Cored the peppers, then removed any left over seeds, and spine. Once you're done doing that, the turkey should be ready, and you can begin scooping it up and filling in the peppers. When you have the peppers all stuffed I like to add a top layer of mozzarella cheese. You can now place these in a pan suitable for however many you decide to make. Get your oven preheated to 400 degrees, and place the peppers in the center. I let these ones bake for about 20 minutes. I like when the cheese reminds of the cheese off a pizza. That's when I know they're done. 3 weeks ago, I entered another contest on Instagram on Hoo Rag's page. This one was simple, because, I was only needed to comment on the photo. They chose 4 people to win, and yours truly was one of them. Hilarious! I couldn't stop laughing. This is borderline ridiculous. The winners got to choose which Hoo Rag they wanted. I received my Hoo Rag the same day I decided to make another appearance at the warm water discharge to get my fishy fix in. That guy hates me so much. Upon arrival at the WWD, I was surprised to see I was the only person there, but that was short lived. The kid/teen in the background showed up, and he is notoriously annoying to all of the fishermen that fish the discharge. I had a few encounters with him last year, but he didn't recognize me with my new Hoo Rag on. My superior skills in annoying certain people proved to be too much for him, once again. I win! I fished for 15-20 minutes, caught a few bluegill, took a few pictures, and beat a pest at his own game. I'd say that was a successful outing. Spring is right around the corner, and I am excited! I decided to start cleaning up and organizing my boxes, prepping them to be messed up all over again after the first 2 outings. I really wish tacky built a fly box for a bass angler. I am starting to really dislike seeing this recurring issue. How about you? What kinds of fly boxes do you recommend for bass flies? While I was going through all of my flies, I took notice and made a separate pile for flies that I did not tie. Other than most of my trout dry flies, these are the only other flies, that I don't tie, but love to fish. Those Todd's Wiggle Worms drive bass absolutely insane...and the Boogle Eye Poppers...how could you not love those top water flies. Great quality and they have a great popping action for bass and panfish. Anyone else use those 2 flies, and love them?? In December, F3T (Fly Fishing Film Tour) held a photo contest along with sponsors Abel Reels, and Ross Reels. The contest would have 2 winners. 1 for Abel Reels that represented their slogan "Crafted for Chaos." The other for Ross Reels slogan "Made on the water." The picture that best showcased Ross Reels - Made on the water, was a photo by, Tim Morrison. His Instagram name is @steelhead_dreams. For being chosen he won a reel from Ross Reels. I'm not quite sure on the model, but congratulations to him. I think they chose a great photo. The picture that best showcased Abel Reels - Crafted for Chaos, was yours truly! 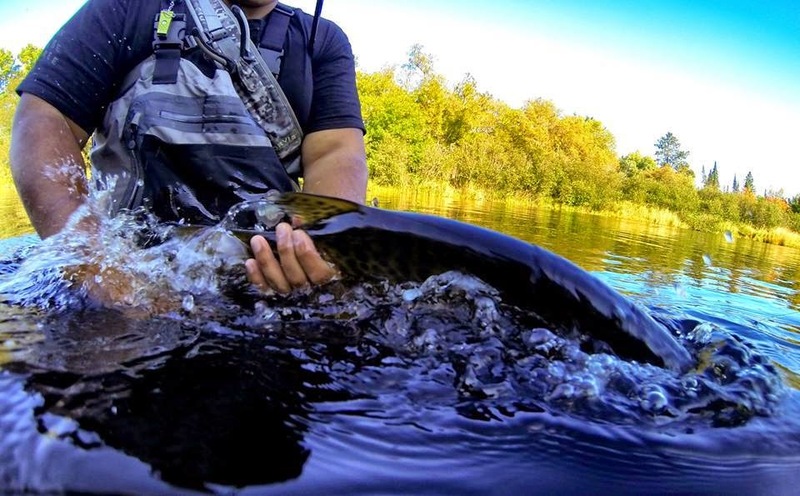 My musky release photo got me the win. I still cannot believe I was picked to win! I was sent a beautiful Abel reel, that I will show off below. Here is the picture that was chosen. Here is the beautiful reel I was sent. It's an Abel Reels Classic click and pawl. It's rated a 3/4/5 wt, and it's in my favorite color blue! HOW FREAKING AWESOME!!! A big THANK YOU goes out to the F3T, and Abel Reels! Thank you, mas much! So, in November I won a Yeti Cooler, and now I win an Abel Reel....I seriously must have a horseshoe shoved way up my keester! That's the only logical thing I can think of. My GF said I should really start playing the lottery. I think she's right! Any suggestions on what I rod I should look to pair this rod with? I was leaning heavily towards the 5/6 Featherweight Eagle Claw. I've been wanting a fiberglass rod, and not wanting to speed big bucks. Plus, I think the blue and yellow are a perfect match! I'm finally all caught up with the Geo Bass series, and I just gotta say, WOW. I am extremely envious that these guys get to go all over the world and fish for these crazy big bass!! Like the Motiv Fishing team, I have never heard of these species, until I watched their series. I would love to some day share the water with these guys. They seem like a fun bunch! One day, I will be able to take an adventure like these guys do. ..